2 Year Blogiversary & New Monthly Crafting Challenge! Happy New Year everyone! My blog is 2 years old today 😀 2014 really went by quickly, likely because I was so busy writing books. Since the beginning of this blog in 2013 my first goal was to share my adventures in destashing my fabric collection, which is actually still going after all this time! I still have a decent amount of quilting cottons, some knits, satins, fleece, and a smidge of heavyweight fabrics. Call it a recipe for disaster, but I’m thinking I might actually get my fabric stash down to a manageable amount this year. I’d even be happy with just nearly full boxes of everything x3 no more overflow! As of today, I’m up to 66 free projects I’ve collected ^-^ it’s been a real wild ride, but I’m hoping I can get that number up to at least 100 by this year or next year to really bring my stash levels down. In other news, today starts a new year of the Monthly Crafting Challenge! Back in 2013 I made a set of sushi plushies and challenged you all to earn and make them throughout the year, and 2014 was a set of Japanese snack foods in plush form. Now that 2014 is all over, you can now purchase all the patterns together at a huge discount. I have to say 2014 was successful because I got nearly 3 times as many project photo submissions as 2013! Thank you so much to everyone that made something and sent a photo in 😀 It’s really the highlight of my day to see your work ^0^ just keep ‘em coming! 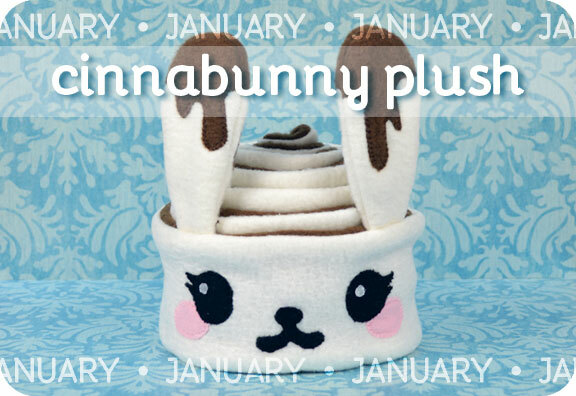 For January, it all starts with this adorable Cinnabunny! In case it’s not obvious, Cinnabunny is a combination of cinnamon bun and bunny but with twice the cuteness of course ^-~ It’s a very simple plush that’s a rolled up bit of fabric to make the distinctive pinwheel shape. Add to that some perky ears (dripping with cinnamony goodness) and an adorable blushing face and you’ve got the first of 12 punny food animals. Of course for January I picked a cinnamon bun because winter just seems like the perfect time to cozy up with a warm bit of doughy goodness like that. You can get the pattern for this plush by signing up for email updates (found in the submission box on the right side of the page below the search bar). If you have trouble signing up, you can check out more info at the main Monthly Crafting Challenge page, the FAQ, or by emailing me. If you’ve already signed up for emails, that’s where the challenge comes in. You can get this pattern if you make one of the projects from this blog, my books, or my Etsy then email me or message the finished project to my Facebook where I have a really awesome collection going of your creations! Keep sending me photos every month and you’ll get a new free pattern. Also, bonus! for today only I’m offering both this pattern and the one from December when you sign up. After today though, the prize is just this guy 🙂 You’ll have to purchase the older pattern through my Etsy if you’re too late. Categories: 2015 Collection, Monthly Crafting Challenge | Tags: animal, bunny, challenge, cinnamon, craft, cute, dessert, free, gift, kawaii, pastry, pattern, plush, rabbit, roll, sewing, soft, stuffed, sweet, update | Permalink.